On 9 September 2015, a royal milestone was reached as, after 63 wonderful years of sovereignty, Her Majesty The Queen became the United Kingdom’s longest reigning monarch. What a reign it has been, characterised by unparalleled cultural change and with personal highs and lows that we, as a nation, have shared. 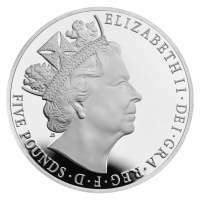 The Queen, ever-respectful towards her predecessors, has acknowledged the occasion quietly and we have marked the moment with a specially created £5 coin. Renowned artist James Butler MBE RA, designer of The Queen’s Great Seal of the Realm, has created both the obverse and the reverse of this commemorative £5 coin. The coin’s reverse bears the familiar symbol of royalty, the Coronation Crown, while the obverse features a rare, commemorative effigy of Her Majesty. 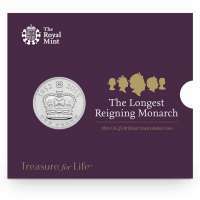 This historic coin has been finished to Brilliant Uncirculated standard – a lasting way to mark this once-in-a-lifetime event. It is accompanied by a booklet that details highlights of The Queen’s reign, from the televised coronation to Her Majesty’s first supersonic flight, and even her first Twitter post. The £5 coin is the traditional way to mark special royal event, so, in keeping with this tradition, a commemorative £5 design has also been issued to mark The Queen becoming Britain’s longest reigning monarch. 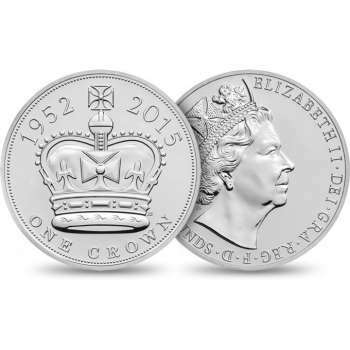 The reverse design by James Butler features the Coronation Crown, the dates ‘1952 – 2015’, the initials ‘JB’ for James Butler and the words ‘One Crown’, which pay tribute to the significance of the fact that one person, Queen Elizabeth II, has worn that crown between the years 1952 and 2015. Both sides of the coin feature new commemorative designs, with a new effigy of Her Majesty on the obverse and the Coronation Crown she wore in 1953 as the principal focus of the reverse. But what has surprised and confused collectors is an apparent double denomination which is unprecedented on a British coin. The Crown denomination was first introduced in the 16th century during the reign of Henry VIII, and had a value of Five Shillings. It retained that value right up until decimalisation in 1971 when it was re-tariffed to its new decimal equivalent of 25 pence. A total of four ’25 pence’ coins were issued between 1972 and 1981 although interestingly the new decimal denomination was never actually used on the coins and they have always been known as ‘Crowns’ owing to their identical size. 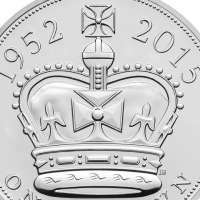 In fact historically, the denomination ‘Crown’ has very rarely appeared on the coin itself, and the words ‘One Crown’ never have, which adds even more confusion over its inclusion in the Royal Mint’s latest issue. [The Guinea was last struck in 1813, although it's denomination of £1 and 5 shillings is still recognised today in farmers markets and at the races. ]The Guinea was last struck in 1813 but its denomination of £1 and 5 pence is still recognised today in livestock markets and at the races. 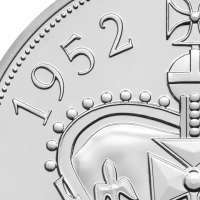 Whilst the new coin has an official face value of £5, the extra “One Crown” wording suggests a total face value of £5.25 – the equivalent of 5 Guineas. 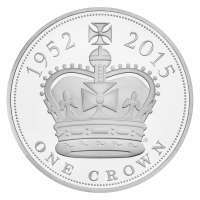 So perhaps the new Longest Reigning Monarch Coin will become known to collectors as Britain’s New 5 Guinea Coin?